Drive Yourself Wild... Experience the Thrill of a Real Safari! Long before there were drive-through fast food restaurants and dry cleaners, Lion Country Safari invented the drive-through. From the comfort of your own air-conditioned car, you can experience a four-mile drive-through safari, where you may see a thousand free-roaming animals of a hundred different species. Take your time and enjoy the antics of lions, white rhinos, zebras, ostriches, chimps, African elephants, giraffe and so many more fascinating creatures. A morning visit during feeding time – around 10:30 a.m. – may bring you to within inches of the wild thing of your choice. Your adventure doesn't stop there. 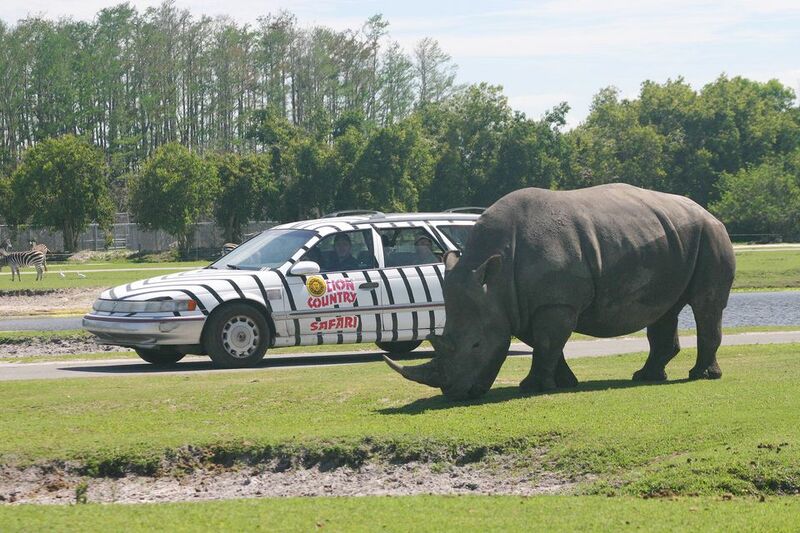 After your leisurely drive, park your car and visit Safari World. The tree-shaded walk-through entertainment area will bring out the kid in you as you take in the Animal Theatre presentations, petting zoo, nature walk, aviaries, pontoon boat tour, paddle boats, animal-themed carousel, amusement rides, miniature golf, picnic area and more animals! If you camp, you may want to spend a night or two at the adjoining KOA campground which features primitive, tent (electric & water), RV (full hook-up) and cabin facilities. Lion Country Safari was developed in South Florida by a group of South African and British entrepreneurs, who wanted to bring the experience of an African game park – then and now, an expensive and time-consuming trip – to families who would otherwise not be able to experience an African safari. When it opened in 1967, in rural Western Palm Beach County, dozens of lions roamed free. America's first cageless drive-through zoo, Lion Country Safari, helped revolutionize zoo and wildlife management philosophy. Since its opening, it has remained a leader in wildlife education and conservation providing a natural environment for rare and endangered animals to live and reproduce, enjoying particular breeding success with the African elephant, white rhinoceros and giraffe. Opening day saw cars lined up for several miles from the entrance, and during its first year over 800,000 people visited. To encourage repeat visitation, Lion Country Safari soon reduced its number of lions and added a greater variety of species. Safari World, the tranquil, walk-through entertainment area of the park, was developed and improved since the park opened, as was its on-site KOA campground added in November, 1983. Lion Country Safari is on the brink of a major redevelopment and expansion of its Safari World walk-through complex. The expansion will see a new alligator exhibit, giraffe feeding exhibit, water play area, children's play area, and party facilities. The KOA campground will also increase its capacity by adding between 20 and 30 new cabins. Lion Country Safari drive-through is open daily rain or shine form 10:00 a.m. to 4:00 p.m. and the walk-through park is open 10:00 a.m. until 5:00 p.m., but please allow at least four hours to enjoy the total experience. Regular admission for ages 10 to 64 is $31.50*, seniors age 65 and over is $28.50*, children ages 3 to 9 is $23.00*, and children two and under are admitted free. Annual passes are available and pay for themselves in just two visits. Parking is $7.00* per vehicle. A printable discount coupon is available for $7.00 off (or more) regular admission for each person in vehicle. KOA camping rates varying according to season and hook-ups. Convertibles or soft-top vehicles are not permitted into the preserve. Rental vehicles are available for a fee — cars $10.00 and 15-passenger vans $18.00 per every one and a half hours. Pets are also not permitted, but kennels are available for a $5.00 refundable deposit. Before you visit, print this PDF map of Safari World to plan your time at the amusement park. You must drive through Lion Country Safari with your car windows up. If you are visiting during the summer and your car doesn't have air conditioning, rent one of Lion Country Safari's vehicles for a more comfortable visit. Lion Country Safari is located at 2003 Lion Country Safari Road in Loxahatchee. It is 15.5 miles west of I-95 on Southern Boulevard (St. Rds. 80/98/441). The attraction is also easily accessible from the Florida Turnpike (Exit 97).